Home > September 2017 > India's GDP growth slowed to a three-year low of 5.7% in the April-June quarter 2017-18..
India's GDP growth slowed to a three-year low of 5.7% in the April-June quarter 2017-18..
India's GDP growth slowed to a three-year low of 5.7% in the April-June quarter 2017-18 due to the roll out of goods and services tax (GST) and some lingering impact of demonetisation. Most experts see a rebound ahead and the economy to end fiscal 2018 with 7% growth. 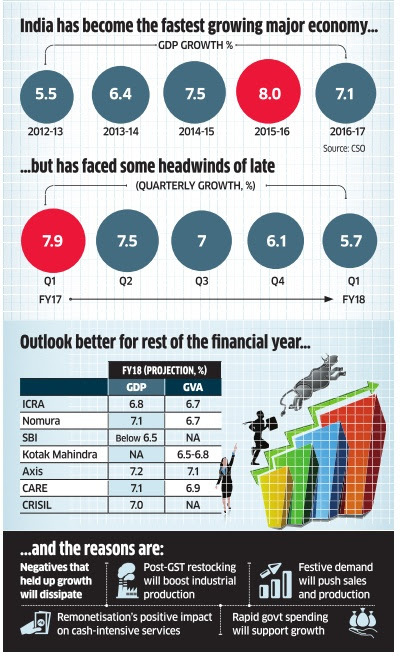 Kirtika Suneja, ET takes a look at the economy's performance and outlook (first quarter numbers are included in the forecast).